Sales of new single‐family US houses in October 2018 were at a seasonally adjusted annual rate of 544,000, according to estimates released jointly Wednesday by the US Census Bureau and the Department of Housing and Urban Development, Wednesday. Although weak, this was only a little below the initial report for September of 553,000 (now revised up to 597,000). The largest declines were in the Northeast, possibly due to a combination of higher interest rates and changes in the tax law. In October 2018, 42,000 new homes were sold. One year ago, 49,000 homes were sold in October. The all time high for September was 105,000 in 2005, and the all time low for October was 23,000 in 2010. The months of supply of new US homes for sale increased in October to 7.4 months, from 6.5 months in September. This is above the normal range of approximately 5 months. The all time record was 12.1 months of supply in January 2009. 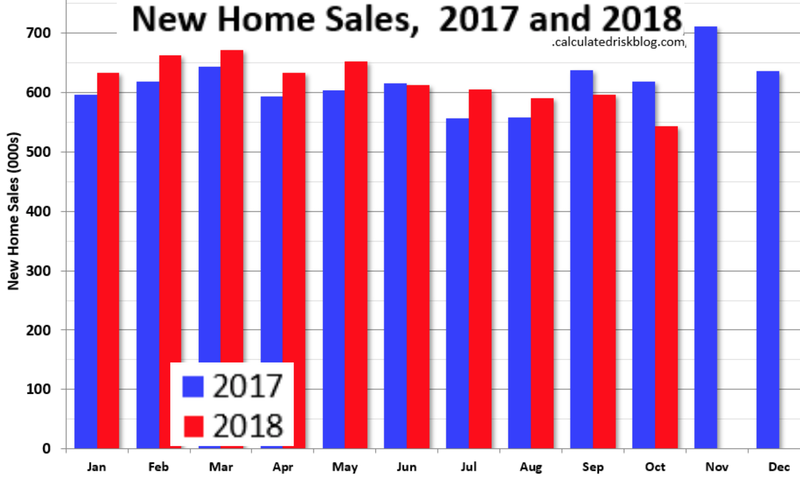 For their part, pending home sales in the US declined slightly in October in all regions but the Northeast, according to the National Association of Realtors® Thursday. The PHSI in the Northeast rose +0.7% to 92.9 in October, and is now -2.9% below one year ago. In the Midwest, the index fell -1.8% to 100.4 in October and is -4.9% lower than October 2017. 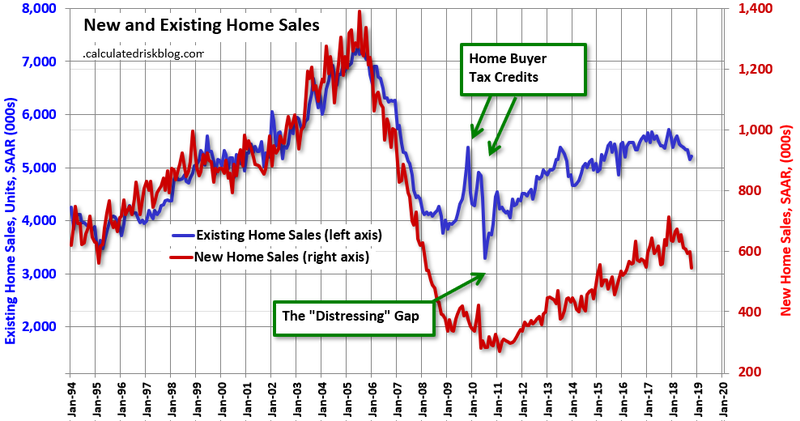 The “distressing gap” graph above, via Calculated Risk, shows existing home sales (left axis) and new home sales (right axis) through October 2018. This graph starts in 1994, but the relationship had been fairly steady back to the ’60s.